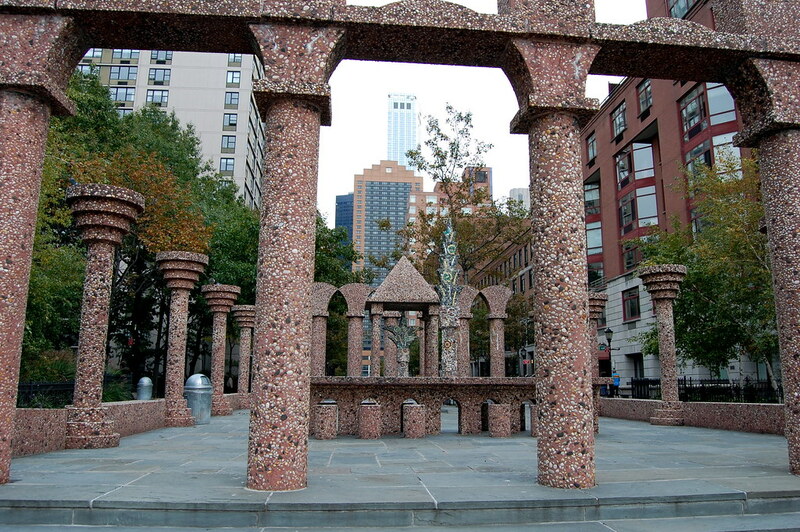 "Battery Park City, the colossal landfill development on lower Manhattan's western flank, will make a great ruin someday," Peter Schjeldahl wrote, in the short-lived New York-based weekly 7 Days, back in 1988, when the complex was still under construction. He was probably right: the massive, anonymous apartment buildings are going to look pretty wild when they are run down and deserted. R.M. Fischer, Rector Gate, 1988. 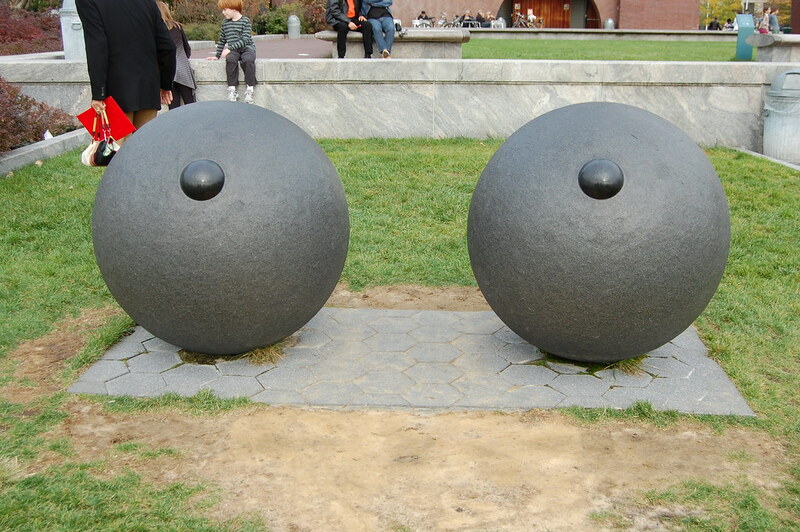 Stainless steel, bronze, granite, lighting 50 ft. x 28 ft. When I visited yesterday, to take a look at the public-art installations that had been included in the project (which Schjeldahl juicily describes as "lavish"), the sprawling public spaces — nearly empty during the writer's visit more than two decades ago — were filled with people. They were mostly tourists, from what I could discern from passing conversations, and they strolled leisurely, apparently undeterred by the brutal ugliness of the concrete expanses. Most of the late-1980s works are giant-sized. 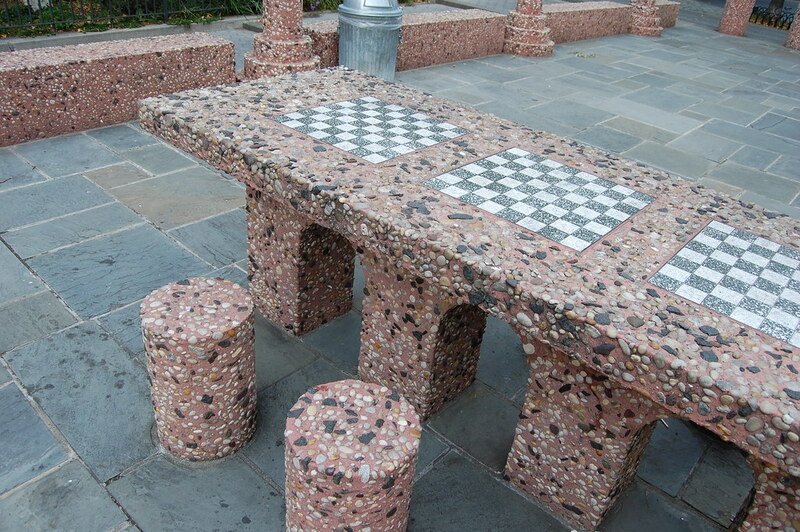 There is roofless temple structure by Ned Smyth, pictured below, adorned with colored glass, gravel, and blue stones, and filled with a table lined with chessboards. Supremely weird and wonderfully out of place, it reads as a direct repudiation of the corporate architecture in which it is enclosed. R.M. 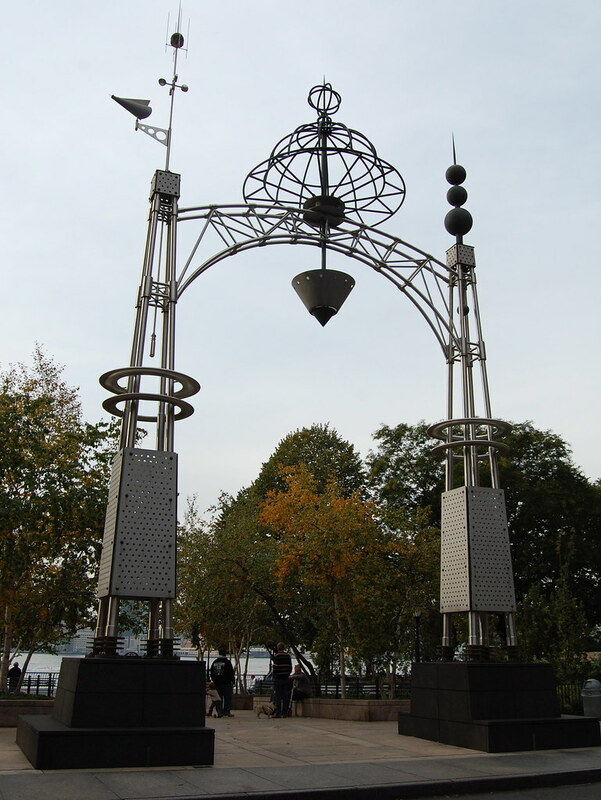 Fischer's 50-foot-tall Rector Gate, pictured above, is almost equally bizarre, a hybrid of a weather station and an amusement park. The upside-down cone looks ready to kill people walking underneath: quite a different vibe from the sculptures he showed last year at K.S. Art, which looked like they just wanted to cuddle. Partial installation view of Ned Smyth, The Upper Room, 1987. 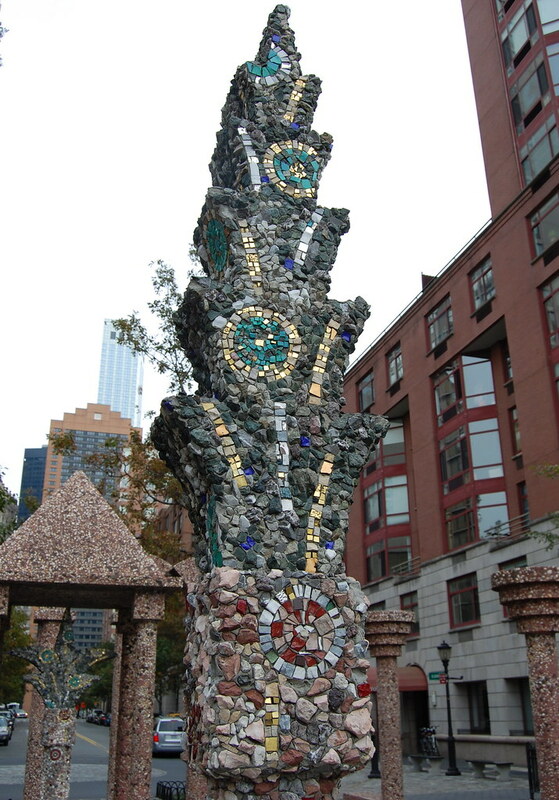 Concrete with blue stone aggregate, colored glass, brass, gravel, bluestone 34 ft. x 67 ft. x 14 ft. 4 in. 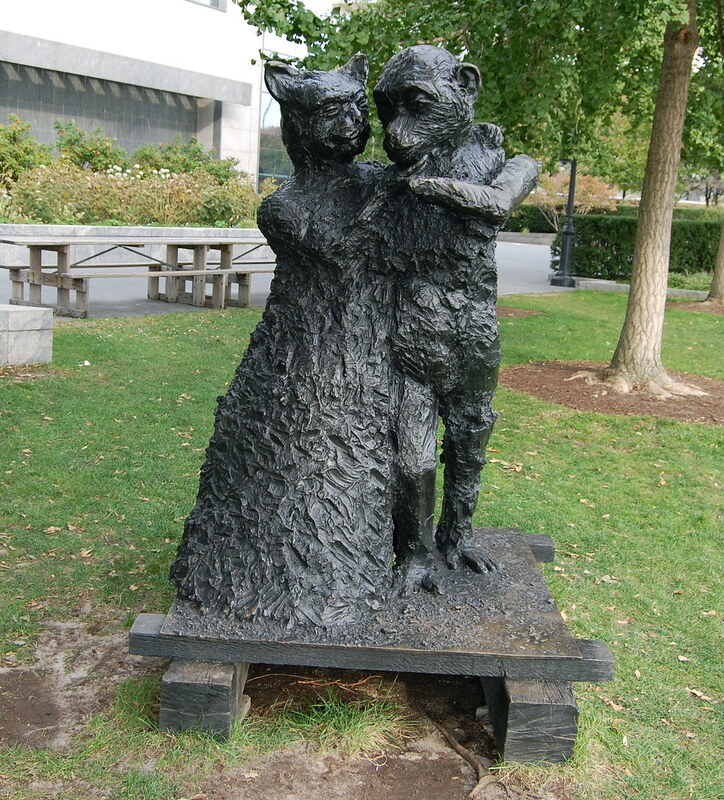 Jim Dine, Ape & Cat (at the Dance), 1993. Bronze and wood, 5 ft. 7 in. x 4 ft. 6 1/2 in. x 5 ft. Partial installation view of Tony Cragg, Resonating Bodies, 1996. 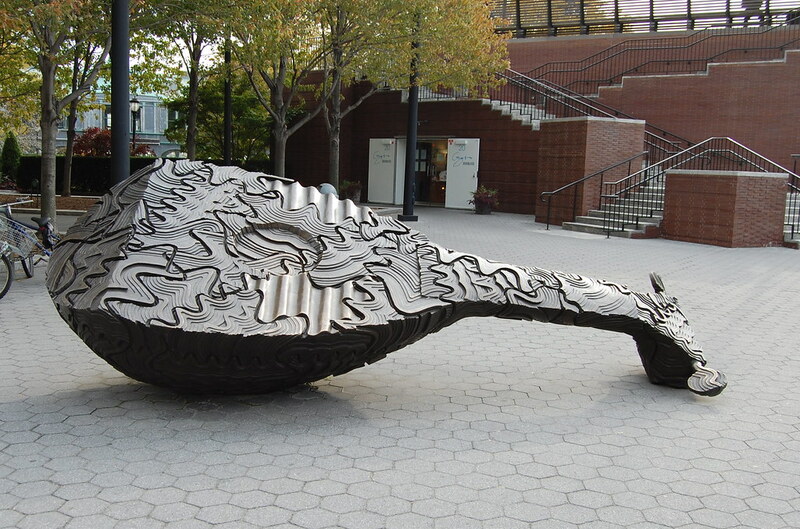 Bronze, complete sculpture: 15 ft. x 5 ft. 8 in., 5 ft. x 6 ft. x 15 ft.
As ambitious as the works are, they are not the reason to make the trip over to Hudson. 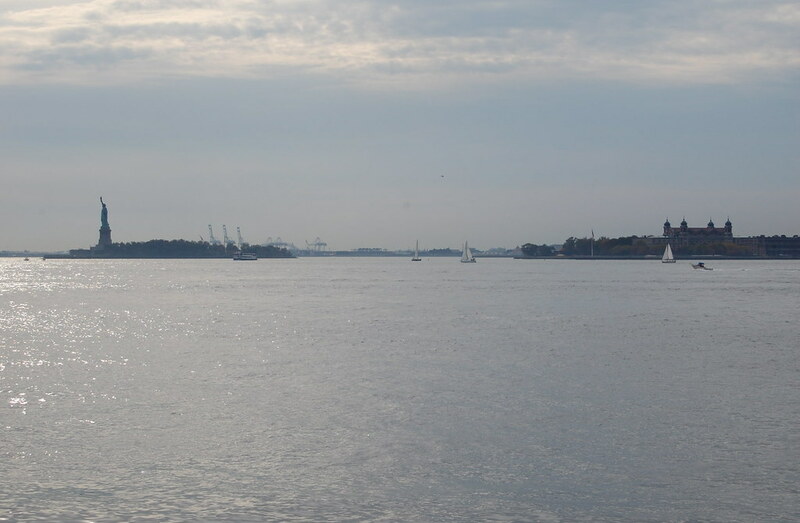 Schjeldahl again, speaking the truth: "[Y]ou can't beat the view."